The Barimen Legacy is a story that follows the adventures of a virtual family in the Sims 3 through ten generations. The blog, which found it’s beginnings on the now-defunct Sims3Legacy.com, is a variation of the “Legacy Challenge”. I do not play the challenge for points, so therefore take some liberties with the game for the sake of telling the story. While there is an ongoing storyline I plan to continue to evolve throughout all ten generations, none of the legacy sims have any sort of predetermined back story. Their personalities evolve as the game evolves, and the events you see in the blog will often reflect events that happen in-game. Obviously, some dramatization has occurred to keep things interesting. I chose a sparce writing style and a purely narrative point of view to better let the images tell the tale. This can really become challenging when I have a very specific dialog I want to occurr between two sims, but have to find a way to convey the meaning of the conversation rather than the exact words. I think this gives each reader a chance to determine for themselves exactly what was said. Besides, we do this when playing the Sims 3 anyway, since all we hear is simlish in-game. The heirs or heiresses to the legacy will be the first-born of each generation, falling to the next oldest child in the event of a tragedy. The legacy will fail if the entire family is somehow wiped out. I wanted a family trait I could use metaphorically, so I chose Angler [He said to them, “Come after me, and I will make you fishers of men.” – Matthew 4:19]. This may have some significance later on in the legacy. I also have reserved the right to “re-roll” any time the Evil trait comes up in the family (it is honestly just a personal preference). As for myself, I am a forty-something father of four five six kids, ranging in ages from twenty years old to two years old. I am a programmer by profession, and spend a lot of my time volunteering with Trail Life USA. I am unapologetic in my traditional beliefs on many topics. I am also unapologetic in my belief in God, and I strive to live my life in service to Him. Therefore, you may find religious themes and commentary on traditional values. If these offend you, this is probably not the blog for you. I started my life-long hobby in gaming with Dungeons and Dragons when I was twelve. It has been the one thing I have always enjoyed. I played pen and paper games well into the 90’s (Amber Diceless, mostly) until my second child was born. Gaming nights just weren’t possible any more. So my wife and I began to play video games to fill the gap. She’s more of a puzzle and word game fan, and enjoys competing against others online. while I leaned more toward the RPG type games. 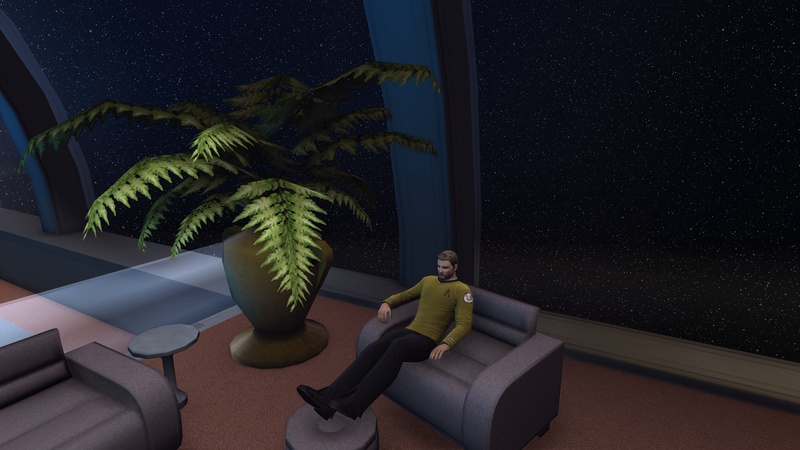 I began with the Sims, but found a group of story tellers who contributed to a Star Trek themed PBEM. I did this for many years, but eventually got sucked into The Sims 2, and inevitably the world of MMORPG. I played City of Heroes for a few years, and recently, I’ve been playing Star Trek Online and Fallout 3. I enjoy feeback of all kinds, good and bad. I visit other legacy blogs and enjoy reading some of the amazing content other writers have created. I just ask that if you comment, please do more than simply advertise your own blog. I’m so glad you were able to save your legacy!! I’ll probably be doing the same within the next week or two. I just need to re-write everything. It’s still under construction but let me know what you think and add it to your blogroll if you like it please! Thanks for the feedback, and I’ve got you blogrolled. So much creativity from the Sims3 community! I love it! Thanks for reading and commenting on my current blog. I’m really glad you enjoyed it. It is so nice to see another Christian gamer/writer! I really hate how my characters seem right now – the language they use isn’t something I enjoy. But I plan to bring my beliefs into their lives at some point, and I want the change that occurs to shine ever-the-more brightly! Keep writing – your blog is great, I cannot wait to read more. Thanks bro! And I am likewise thrilled to see another Christian gamer! Your story absolutely rocks, and I’m really looking forward to more. I will continue to read the Barimen legacy and it’s your story that prompted me to start writing in the first place. So I just wanted to say thanks. Thanks for creating the Barimen family and thanks for inspiring me to try and become a better writer. Hi there Zoxell. I found your site under the Belgravia Legacy. And of course I snooped around in the About section. First of all, congratulations on your new baby. And then I’d like to say, it’s great to ‘meet’ a Christian gamer/writer. Feels like they are so rare these days. Thanks for the visit and kind comments! I’ll be sure to add your site to my links, and hopefully have some “free time” to start reading other writers’ blogs. Hey there! Thanks for linking my page…I didn’t expect it. I’ve been reading your legacy and I really like it! I didn’t have much time to read all of it (I’m still at Mark Barimen) but i check in once in a while. I just saw your post about your new baby.